Fashion is one of those things that really lets you express yourself and let your personality shine. Fashion at country music festivals range from subtle pieces of clothing that will keep you cool, to the down right bizarre, designed to get your attention and talk about it – It’s not unusual to see a cowboy hat made out of an empty beer box! Walking around the grounds of Boots & Hearts we have observed the #BootsLife requires very little clothing. We’ve compiled a list of the top 5 fashion trends of Boots & Hearts. This is a popular trend for both men and women. The men’s overalls are typically cut into short shorts, with only one strap done up, and the other dangling behind. Of course, there’s never a shirt underneath those overalls – because that would be impractical… duh. The lengths range from full pants, to booty short. Let’s just say we’ve seen a LOT of tan lines. The women’s overalls are typically more refined. They’re typically a light denim, full length, with both straps done up. It’s hit or miss whether women are wearing shirts under their overalls. It’s either a tank top or a brightly coloured bra to add a splash of fun to their outfits. These overalls are often paired with a bandana tied around the head. Always red, of course – just think Rosie the Riveter. The next fashion trend that we observed at Boots & Hearts Music Festival was seen in a couple of different ways. Bandanas! Everywhere you looked you could observe tons and tons of bandanas. Men and women alike were sporting bandanas. Some people simply wore them folded and tucked into their back pocket hanging out – kind of like a tale. Others wore them folded and tied around their heads like a headband (similar to those ladies in the overalls above), and our own Scott Edwards. Some even paid homage to the 90s and wore them like they did back then, with the tail flapping loose over the head. Other’s simply had them tied around their necks like a bib – which I guess is helpful if you’re a part time bandit on the side. Part of the popularity of the headbands is partly due to the fact that Flor de Cana was giving them away in the VIP area, and Jack Daniels was giving some away too. But the majority that we saw were red, and clearly not a piece of swag with a boozy logo. This fashion trend has now been a popular look for country music festivals for the last couple of years. It’s bordering on completely unoriginal, but it’s clearly still a very popular trend, which is why it’s Number 3 on our list of top fashion trends at Boots & Hearts Music Festival. You know the look well. Cut-off jean shorts, black tee shirt or tank top, and a red flannel shirt tied around the waist. Actually, it was often accompanied with a bandana around the head. What was interesting about this trend, is that we saw many men getting in on this look this year. They also wore cut-off jean shorts, with the shirt tied around their waists – but no shirts, obviously. This trend was a really fun one to witness! There were so many amazing shirts, either t-shirt or button down, that featured bright colourful fruits. We saw it all. Watermelons, lemons, oranges, bananas, cucumbers, grapes, you name it! We observed that this trend was mostly popular among men, but some of the ladies of country got in on the fruity action too. These shirts were fun. They really stood out, and were so much more original than any of the other trends we’ve talked about. Shirts this bright and unique would also be very helpful should anyone in your group get separated. You would know that when you’re looking for your friend, just look out for the bright watermelon-y torso in the crowd. Genius. 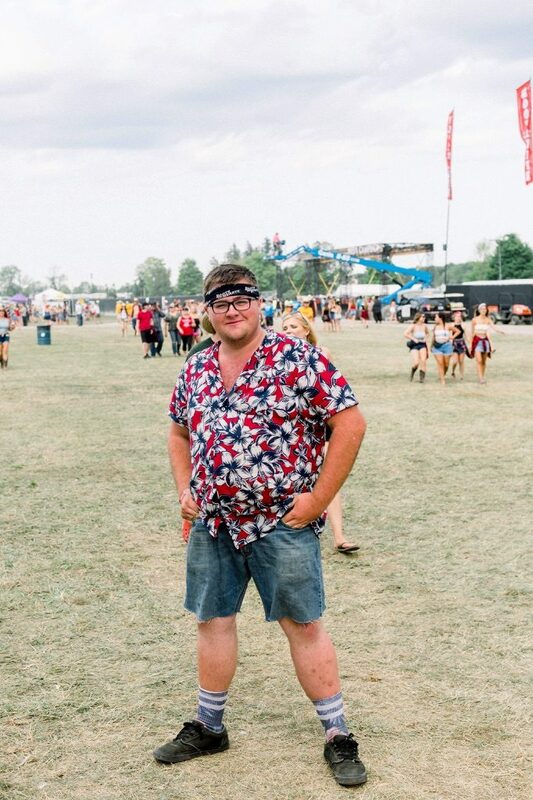 Last, but certainly not least, the top fashion trend at Boots & Hearts Country Music Festival this year was Hawaiian shirts! Everywhere you looked you saw a sea of beautiful, bright colours that featured insane floral prints, or really bright sunsets. It was really something. When walking through the grounds, this was definitely the most prominent fashion trend that we saw. We didn’t see too many women sporting the Hawaiian shirts, but apparently every man at Burl’s Creek packed at least one Hawaiian shirt for the weekend. This trend leads us to wonder — where do you even buy a Hawaiian shirt anymore? This is one trend we never expected to see come back… Fashion is weird. Walking around the grounds, there were so many other great pieces of clothing that people were wearing to help express themselves and boast about the #BootsLife. Some honourable mentions were: rompers (and surprisingly, a couple romp-hims), jumpsuits, and bell bottoms. If you’ve never been to Boots & Hearts and want to experience all the glorious (and tragic) fashion trends, be sure to pick up your Boots & Hearts tickets for next year! Start planning your #OOTD!